In Forest and Field: Um, Um, Good! Thunk, Thunk, Thunk-thunk echoed from a tree along the river, and then it stopped. Thunk, Thunk-thunk, Thunk it began again. 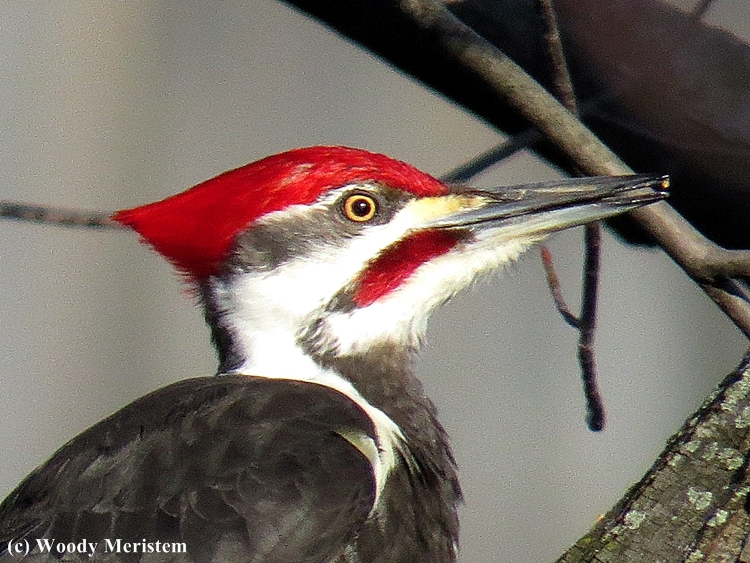 And there on a branch, was a pileated woodpecker hammering away at the limb. It was a female with her black “mustache”. She kept working on the branch for a while, then flew to the trunk of a nearby tree, but never gave a clear view or moved completely out of the shadows. More thunking sounded from a tree closer than the one on which the female landed. This emanated from a male (bearing the red “mustache” sported by male pileateds), leading to the conclusion that this was almost certainly a mated pair. Pileated woodpeckers are usually quite wary, but this bird was so preoccupied with his meal that he ignored me as I turned and slowly walked away. 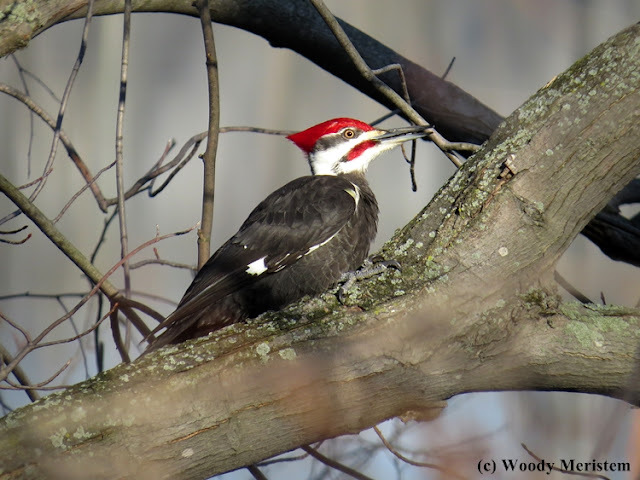 I've never seen pictures of a Pileated that good! Awesome! Beautiful. 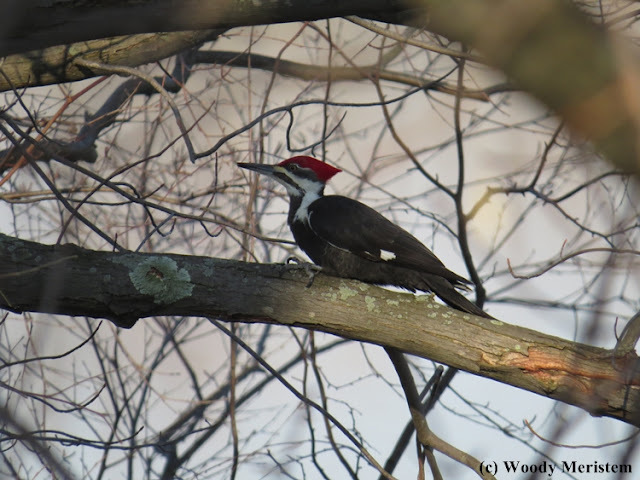 I love the pileated woodpecker. Frequent visitor to my woods. Lovely! They are splendid birdies. I'm hoping to see them in West Virginia this weekend. Hello, beautiful photos and video. 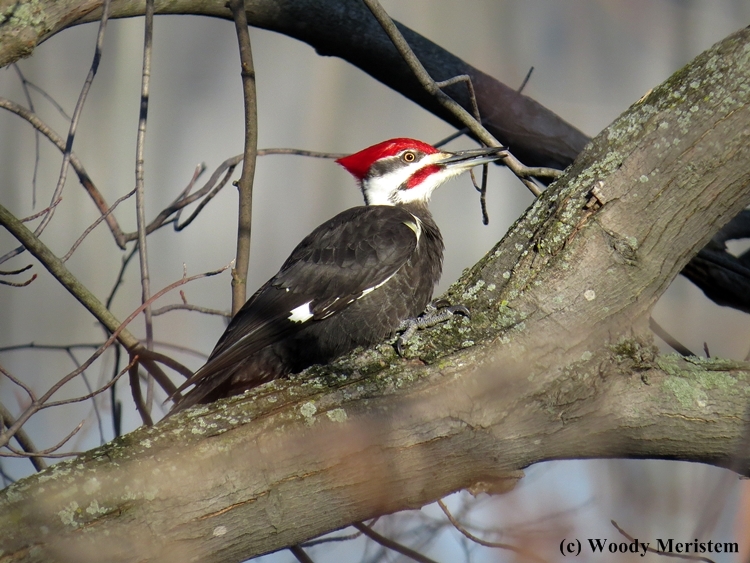 The Pileated Woodie is a gorgeous bird. Great post. Thank you for linking up and sharing your post. Happy Sunday, enjoy your new week ahead! What a lovely creature! His distinct features are incredible!